Television sets are now making the switch from analog to digital. This is why digital boxes are now being used in certain Filipino households. Aside from having more channels to choose from, the digital quality is much better than analog despite the distance of the station’s transmitters. But for families that are after local channels only, these digi-boxes can be expensive. Finally, Haier is unveiling digital televisions that have a digital tuner which help receive signals without delay. This way, the family can enjoy shows in amazing Dolby Digital audio and clear video thanks to its in-plane switching LCD screen panels. You can also record your favorite shows and watch them later with Haier digital TV’s Timeshift feature. Encased in a two-tone design with metallic detail, these digital TVs are sleek as they come. For Haier digital TVs, you can choose between the B8500 and the K5000 series. The K5000 allows you to browse online videos through YouTube TV and has a Smart Share function to use it with smart devices. 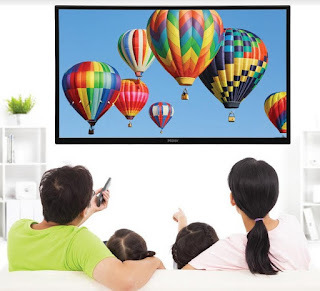 The Haier K5000 digital televisions come in 32-, 40-, 50-, and 55-inch screen sizes. All Haier digital TVs come with a two-year parts and labor warranty.